An advanced non-residential submeter that provides energy, power and power quality measurements, as well as user defined event logs. 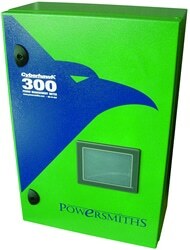 The Cyberhawk 300™ meter offers configurations of up to 3-phase ports without additional meters, saving associated costs and space. The easy-to-use touchscreen display and web-server options allow for convenient setup and data accessibility.